I’ve been seeing a lot of cowl patterns lately and there seem to be two main methods: long & skinny (wrap around multiple times) or tall & short (go over your head once). I’ve been experimenting with both types and I’m still undecided about which one I prefer. Do you guys have a preference? Over the Christmas break I made the two-color cowl from Purl Bee with some leftover light  weight yarn. Although it turned out to be more yarn and time consuming than other cowls I’ve made, I’m very happy with how it turned out. 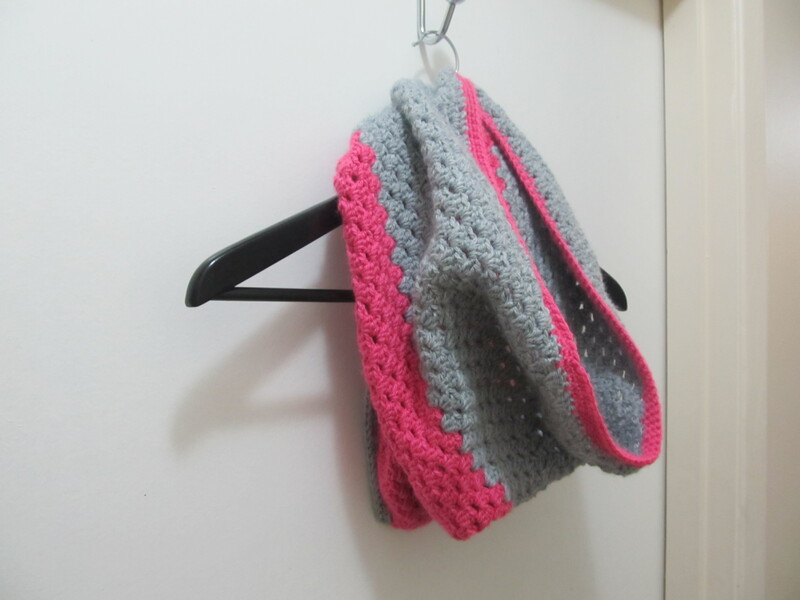 I’d like to make some more, but I’ll probably use thicker yarn and a bigger hook next time so it doesn’t take so long. You may be wondering what ‘Family Day’ is… It’s a brand new statutory holiday in British Columbia (and several other Canadian provinces) that falls on the 2nd Monday of February. It’s basically a made up holiday and an excuse for a day off between Christmas and Easter — and there are no objections here! If you haven’t noticed already, I really like this pattern. On the last 2 pairs I have here I added 3 rows around the thumb too. Here’s a link to the pattern. I also really like these Adeline Fingerless Gloves, and they’re stretchier than other gloves I’ve crocheted. This pattern for Ripple Lace Fingerless Gloves is a nice in-between. They’re stretchier than the single crochet pattern, but not as bulky as the Adeline gloves, but that might also be because I made them with thinner yarn? This one’s my own pattern. I made a case for my e-reader using half double crochets. I have two young and very rambunctious kitties. The one pictured above is Koshka, my sweetheart tabby (Koshka is the Russian word for ‘cat’ – I got her shortly after reading A Clockwork Orange, in which they use a lot of Russian words as slang). I love them both to pieces, but sometimes they drive me crazy trying to play with my yarn when I’m hooking. The solution? Crochet them some new cat toys! These toys have to be some of the quickest projects I’ve whipped up. The first one I made was this ball. I also made the pill-shaped one for a friend of mine, but I only put a tail on one side. When I finished the ‘tailed pill’ toy I realized it looked inappropriate — I ended up not giving it to my friend. 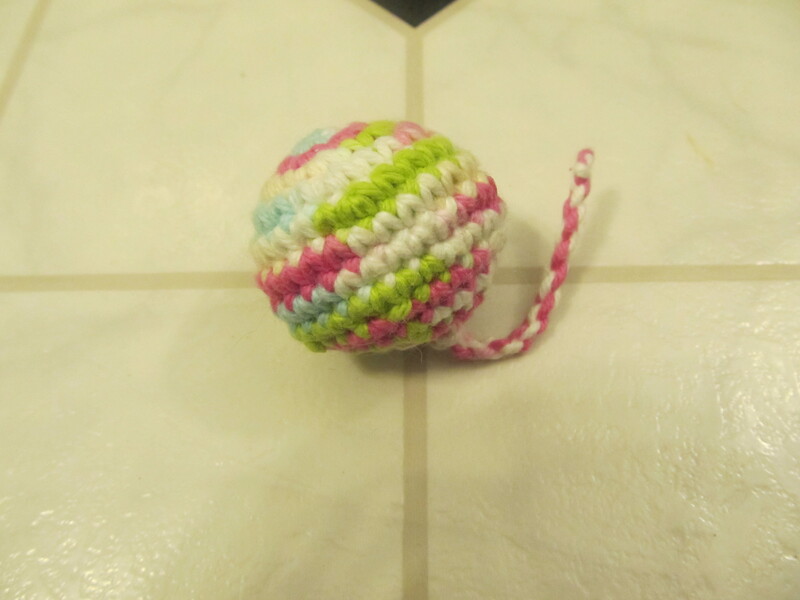 The second one I made was the ‘door hanger bouncy cat toy‘. If you make this, make sure it’s long enough that your cat can reach it. I followed the pattern and it ended up being too high to hang from a door knob.